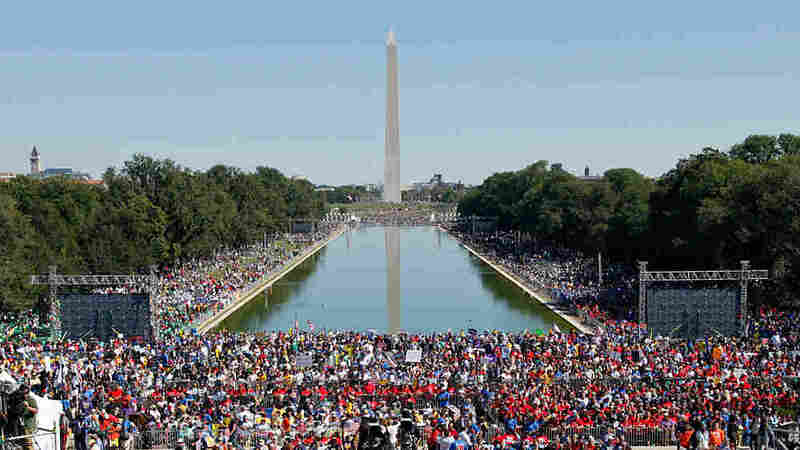 One Nation Rally Energizes Labor, Civil Rights Groups Tapping into anger as the tea party movement has done, a coalition of progressive and civil rights groups marched by the thousands Saturday on the Lincoln Memorial and pledged to support Democrats struggling to keep power on Capitol Hill. NPR National Political Correspondent Mara Liasson tells host Scott Simon this largely Democratic effort is meant to try and bridge the "enthusiasm gap" that has favored conservatives this election season. Tapping into anger as the tea party movement has done, a coalition of progressive and civil rights groups marched by the thousands Saturday on the Lincoln Memorial and pledged to support Democrats struggling to keep power on Capitol Hill. "We are together. This march is about the power to the people," said Ed Schultz, host of "The Ed Show" on MSNBC. "It is about the people standing up to the corporations. Are you ready to fight back?" In a fiery speech that opened the "One Nation Working Together" rally on the National Mall, Schultz blamed Republicans for shipping jobs overseas and curtailing freedoms. He borrowed some of conservative commentator Glenn Beck's rhetoric and vowed to "take back our country." "This is a defining moment in America. Are you American?" Schultz told the raucous crowd. "This is no time to back down. This is time to fight for America." With a month of campaigning to go and voter unhappiness high, the Democratic-leaning organizers hope the four-hour program of speeches and entertainment energizes activists who are crucial if Democrats are to retain their majorities in the House and Senate. The national mood suggests gains for the GOP, and Republicans are hoping to ride voter anger to gain control of the House and possibly the Senate. Erica DeVose, left, of Philadelphia, is hugged by Mike Crossey, of Pittsburgh, while attending the "One Nation Working Together" rally. More than 400 organizations - ranging from labor unions to faith, environmental and gay rights groups - partnered for the event, which comes one month after Beck packed the same space with conservatives and tea party-style activists. Organizers claimed they had as many participants as Beck's rally. But Saturday's crowds were less dense and didn't reach as far to the edges as they did during Beck's rally. The National Park Service stopped providing official crowd estimates in the 1990s. AFL-CIO president Richard Trumka urged participants, including his union's members, to band together. "There is nothing, and I mean nothing, we can't do when we stand side by side, shoulder to shoulder," Trumka said. "We will stand together. And we will win together. And we won't let anyone - and I mean anyone - stand in our way." That starts as soon as the crowds get back to their homes. "Coming out of here, we've got to go home and ask our friends to vote, ask our neighbors to vote," NAACP President Benjamin Todd Jealous said. "Ever forward, never backwards," he led the crowd in a cheer. But even participants recognized the challenge. "There may be an enthusiasm gap, but we're not going to know until we have an election," said Ken Bork, who came from Camas, Wash. "A lot of the noise from the extreme right-wing stuff, it's been well orchestrated by big money. But it's not as bad as they're making it out." Rose Dixon, a health care worker from Pawleys Island, S.C., said she hopes the rally sends a message to lawmakers on Capitol Hill. "Stop the obstructionism. Work together," Dixon said. "Stop playing politics as usual and to put the American people first. We're tired of the politics and the posturing and the games." The Rev. Al Sharpton, addressing the crowd that swelled through the day, warned activists against apathy. 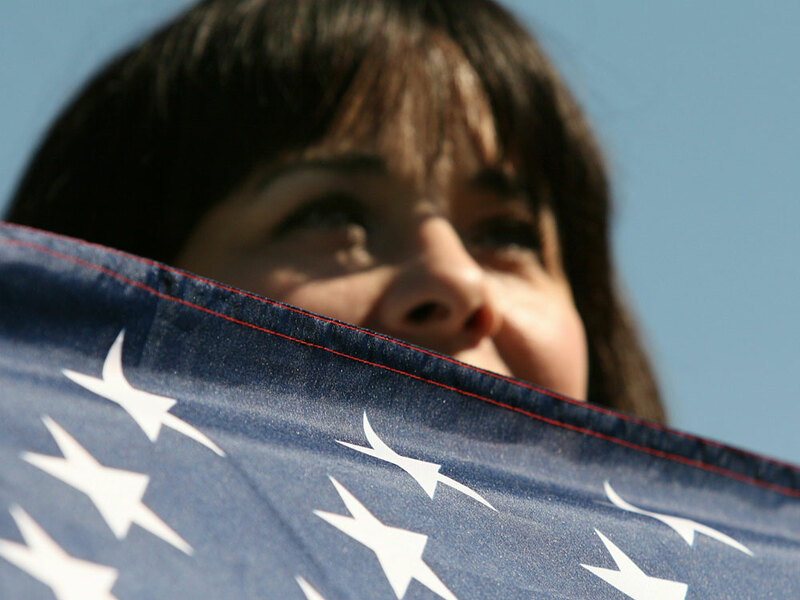 A person with an American flag participates in the One Nation March on the steps of the Lincoln Memorial on October 2, 2010 in Washington, DC. "We've got to go home and we've got to hit the pavement. We've got to knock on doors. We've got to ring those church bells," Sharpton said, urging the crowd to go home and volunteer for candidates. Organizers insist the rally is not partisan. They say the message is about job creation, quality education and justice. 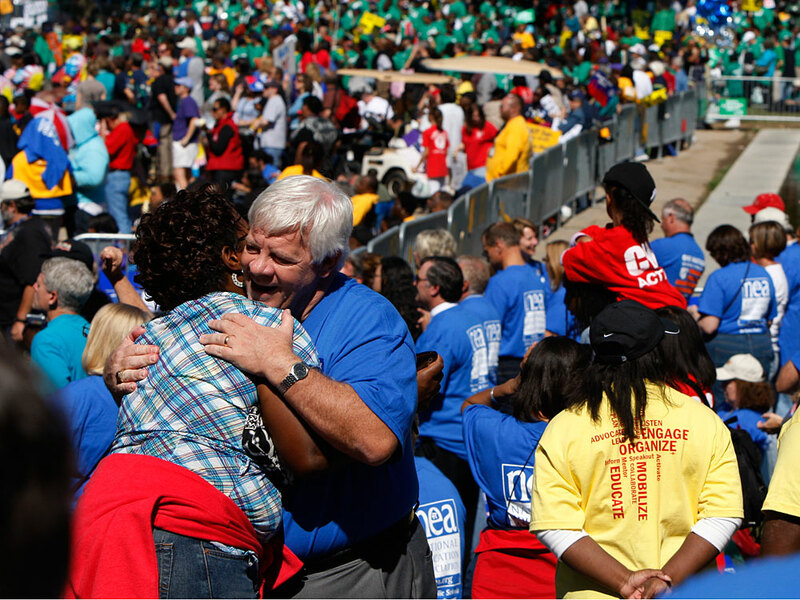 However, the largest organizations, such as the AFL-CIO and the Service Employees International Union, tend to back Democratic candidates. But the speakers hardly shied from criticizing Republicans. "If Sarah Palin had a bright idea, it'd be beginners' luck," comedian Charlie Hill joked from the stage about the 2008 vice presidential nominee. Van Jones, who last year was forced from his job as a White House energy adviser after Beck made public his comments disparaging Republicans, said during his remarks that progressives must stand with Democrats to put America back to work. "They don't need hateful rhetoric. They need real solutions," Jones said. Beck and former Alaska Gov. Sarah Palin gathered near the Lincoln Memorial on the anniversary of Martin Luther King Jr.'s "I Have a Dream" speech to urge a vast crowd to embrace traditional values. Though also billed as nonpolitical, the rally was widely viewed as a protest against the policies of President Barack Obama and congressional Democrats. One Nation organizers said they began planning their event before learning about Beck's rally, and said Saturday's march is not in reaction to that. "We are one nation, coming together." Obama was spending the weekend at Camp David, the presidential retreat in Maryland.